Happy Friday, dear reader! If you’re reading our blog, big thank you! Let us share something with you that was designed purely for internal use, but we had so much fun with it, we decided it would be unfair not to share it with you, our reader in the wider world web. See below our email from today, freshly sent out to Freightera DreamTeam distribution list. with our famous Client Care calling the tune!! Dear All, some of you might have missed that, BUT this week started with our Client Care team making news in social media (see the image #2 below).  Here is the story: Michael got a compliment that translated from North American slang means a very good thing indeed. We later figured it was actually Steven who earned that particular compliment. Anyways, it only proved the point that the happy customer loves both of them. And the rest of us too. 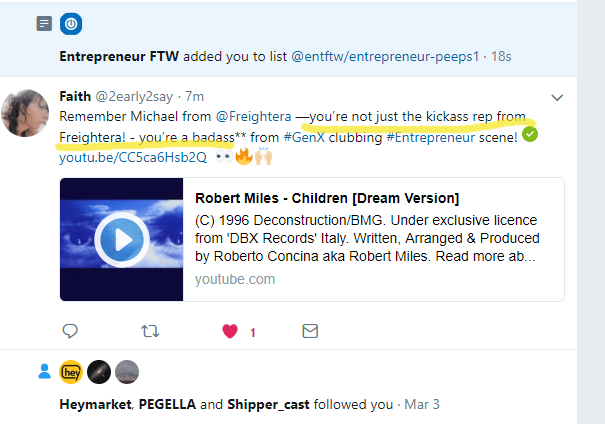 That same week, she told Eric “You guys are like… Zappos!” One of the best compliments we’ve ever heard. And more, CC guys and girls, your Live Chats are not just helpful, but endlessly entertaining. When customers are using smileys in them, it says something. P.S. 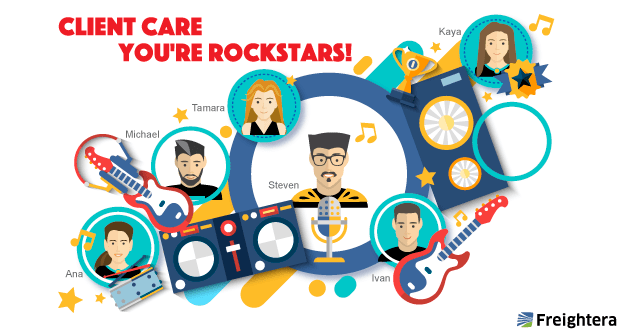 Ksenia (our Rockstar Graphic Artist) and I had a major headache trying to squeeze everyone in this picture until we realized that wouldn’t be a rock group, but a choir, so… With the Client Care ahead of the whole band, please know at your heart, if you are receiving this email, YOU’RE A ROCKSTAR. We are all rockstars, no exclusions. 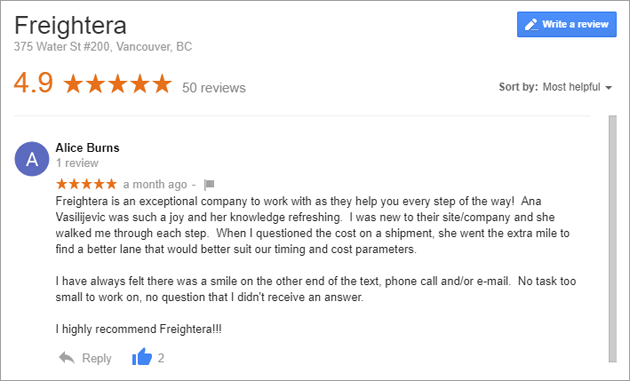 Freightera Care continues to get amazing reviews from our happy customers. We thank our customers, Faith, Alice, John, for your latest kind reviews. You help us spread the word. THANK YOU!